L’EAU FROIDE (COLD WATER), a film that Olivier Assayas made for television in 1994, is in revival until the end of May. Cyprien Fouquet and Virginie Ledoyen in L’eau froide. This entry was posted in FILM, WEB/TELEVISION/RADIO and tagged Cold Water (Assayas), Cyprien Fouquet, L'eau froide (Assayas), Laemmle Royal, Olivier Assayas, Virginie Ledoyen on May 21st, 2018 by Barlo Perry. On the list of the best movies about making movies – Minnelli’s The Bad and the Beautiful, Cukor’s A Star is Born, Fassbinder’s Beware of a Holy Whore, Fellini’s 8½ – François Truffaut’s DAY FOR NIGHT invariably lands near the top. This week, at Laemmle’s 45th anniversary screening of the film, Jacqueline Bisset will talk about her work with Truffaut on the picture. DAY FOR NIGHT, Thursday, May 10, at 7:30 pm. LAEMMLE ROYAL, 11523 Santa Monica Boulevard, West Los Angeles. 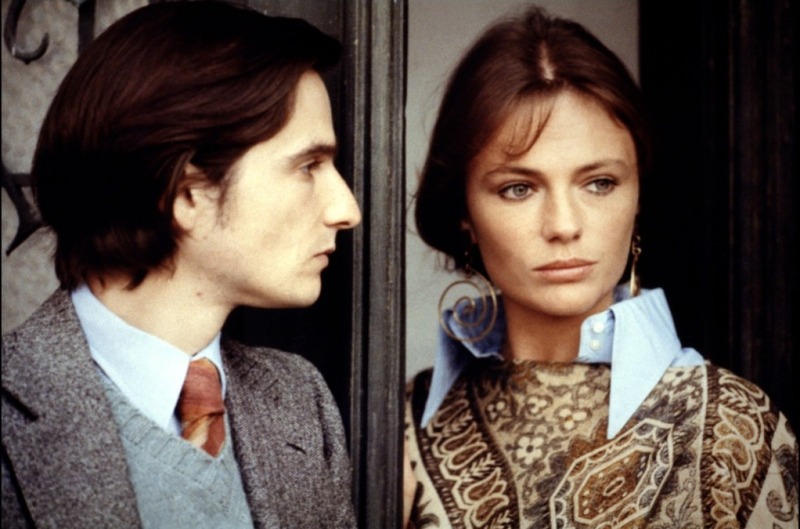 Below: Jean-Pierre Léaud and Jacqueline Bisset in Day for Night. Image credit: Warner Bros. This entry was posted in CONVERSATION, FILM and tagged 8½ (Fellini), A Star is Born (Cukor), Beware of a Holy Whore (Fassbinder), Day for Night (Truffaut), François Truffaut, George Cukor, Jacqueline Bisset, Jean-Pierre Léaud, Laemmle Royal, Rainer Werner Fassbinder, The Bad and the Beautiful (Minnelli), Vincente Minnelli on May 9th, 2018 by Barlo Perry. The American Cinematheque kicks off its upcoming Aero series For the Love of Godard with a members’ screening of LE REDOUTABLE / GODARD MON AMOUR. Written and directed Michel Hazanavicius (The Artist, 2011), the new film is based on the autobiographical novel Un an après (“a year later”) by Anne Wiazemsky. The book covers the period Wiazemsky starred in LA CHINOISE (1967), Godard’s investigation of a group of Parisian Maoists. Wiazemsky and Godard were wed while shooting LA CHINOISE—a paradigm of the director’s creative approach to editing—but the marriage was strained from the start by a director distracted by public indifference to his recent work. At the same time, Godard became entrenched in the burgeoning revolution that had begun in the mid-Sixties at the university at Nanterre, and which culminated in the general strikes and Latin Quarter street battles of 1968—events for which LA CHINOISE had provided an agitprop blueprint. GODARD MON AMOUR—starring Louis Garrel and Stacy Martin—gained Waizemsky’s blessing after Hazanavicius promised her the movie would be a comedy. She joined him at the film’s Cannes premiere last year, one of her last public appearances before her death in October 2017. Subsequent screenings in the series include LA CHINOISE, À BOUT DE SOUFFLE (Breathless), BANDE À PART (Band of Outsiders), WEEKEND, and VIVRE SA VIE, as well as a 3-D presentation of ADIEU AU LANGAGE (Goodbye to Language). With a post-screening conversation with Michel Hazanavicius. Monday, April 16, at 7:30 pm. Wednesday, April 18, at 7:30 pm. Saturday, April 21, at 7:30 pm. Thursday, April 26, at 7:30 pm. Friday, April 27, at 7:30 pm. From top: Louis Garrel (foreground left) as Godard, Stacy Martin as Wiazemsky, and Micha Lescot as Jean-Pierre Bamberger (“Bambam”) in Le redoutable/Godard Mon Amour, image courtesy Cohen Media Group; Anne Wiazemsky and Jean-Luc Godard filming La Chinoise, image courtesy Pennebaker Films/Photofest; Jean-Paul Belmondo and Jean Seberg in Breathless; Anna Karina with Claude Brasseur and Sami Frey at the Louvre in Band of Outsiders. This entry was posted in CONVERSATION, FILM and tagged À bout de souffle/Breathless (Godard), Adieu au langage (Godard), Aero Theatre, American Cinematheque, Anna Karina, Anne Wiazemsky, Bande à part/Band of Outsiders (Godard), Claude Brasseur, Jean Seberg, Jean-Luc Godard, Jean-Paul Belmondo, Jean-Pierre Bamberger (Bamban), La chinoise (Godard), Laemmle Royal, Le redoutable/Godard mon amour (Hazanavicius), Louis Garrel, Micha Lescot, Michel Hazanavicius, Sami Frey, Stacy Martin, The Artist (Hazanavicius), Un an après (Wiazemsky), Vivre sa vie (Godard), Weekend (Godard) on April 15th, 2018 by Barlo Perry.